This old-fashioned frozen fruit salad will remind you of your grandmother's salad. It is a very easy preparation, and it makes an excellent fruit salad for a holiday menu. The salad is delicious with a ham or turkey Thanksgiving or Christmas dinner. Use canned fruit cocktail or use a combination of your favorite canned fruits. Dice a combination of pineapple chunks, peaches, maraschino cherries, pears, and apricots. This frozen fruit salad recipe was adapted from a 1950s newspaper clipping. See the variations below the recipe for an ambrosia-style fruit and nut combination and some substitution ideas. In a small bowl with an electric mixer, beat the chilled heavy cream to stiff peaks. In a large mixing bowl with an electric mixer, beat together the cream cheese and mayonnaise. Fold in the whipped cream, cherries, drained fruit cocktail, and marshmallows. Turn the mixture into a 1-quart freezer container or loaf pan. Garnish with additional maraschino cherries or pecan halves. Freeze the salad until firm. Turn out of the container and slice to serve. Add about 1/2 cup of toasted pecan or walnut halves to the fruit mixture. 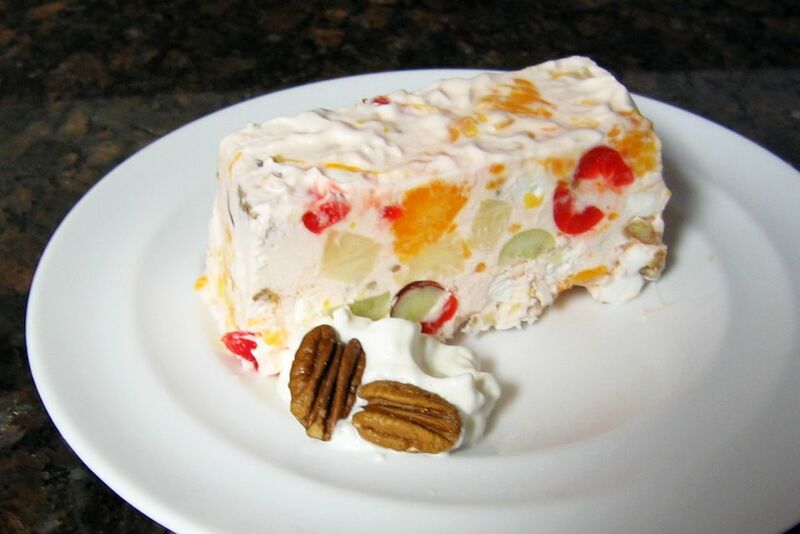 Ambrosia Frozen Fruit Salad: Use 1 cup of drained mandarin orange slices, 1/2 cup flaked coconut, 1/2 cup of chopped pecans, an 8-ounce can of pineapple chunks, 1/4 cup of maraschino cherries, and 1/4 cup of halved seedless grapes. From a reader: Freeze the salad in a large empty juice can. Run hot water over the sides of the can, remove one end with a can opener, and it will slide out easily. The can also leave some nice slicing marks on the salad. Substitute Miracle Whip Salad Dressing for the mayonnaise. For a sweeter salad mixture, add about 1/4 to 1/2 cup of powdered sugar. Use 2 cups of thawed whipped topping or prepared Dream Whip instead of freshly whipped cream.